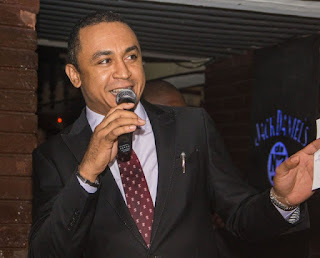 Controversial Cool FM OAP, Freeze has once again taken to his Instagram page to react to a new video of the RCCG General overseer, Pastor E.A Adeboye asking his church members for a N1billion donation. Is the special announcement only for the billionaires? Did Jesus segregate the believers according to their spending power? If I may ask, where did all the billions and hundred millions go to? Did it go into building free hospitals or free schools or factories where workers can work or was it just swallowed by 'church expenses' or was it geared towards building more churches, something we already have much more than enough? When Moses realized that there was more than enough offering to finish the temple, he instructed the Israelites to STOP bringing their offering.. Are we ever going to finish temple building, or is this a perpetual process in Nigeria? Acts 4 ? All the believers were one in heart and mind. No one claimed that any of their possessions was their own, but they shared everything they had. With great power the apostles continued to testify to the resurrection of the Lord Jesus. And God’s grace was so powerfully at work in them all  that there were no needy persons among them. For from time to time those who owned land or houses sold them, brought the money from the sales  and put it at the apostles’ feet, and it was distributed to anyone who had need. And the people continued to bring freewill offerings morning after morning. So all the skilled workers who were doing all the work on the sanctuary left what they were doing  and said to Moses, “The people are bringing more than enough for doing the work the Lord commanded to be done.”  Then Moses gave an order and they sent this word throughout the camp: “No man or woman is to make anything else as an offering for the sanctuary.” And so the people were restrained from bringing more,  because what they already had was more than enough to do all the work."